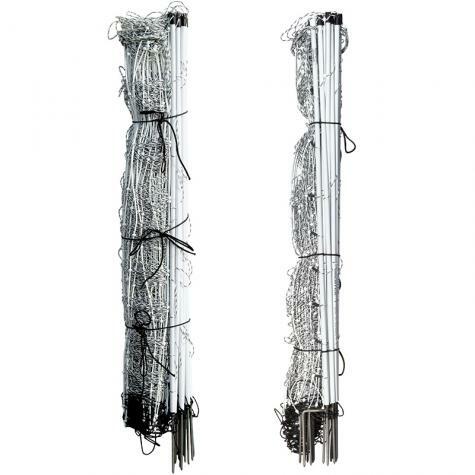 An extra “live” horizontal strand. Lowest live strand is only 4" above the soil (vs 6" for PermaNet). Verticals every 12" (vs 6"). Strutted verticals instead of string. Less likely to sag between posts. 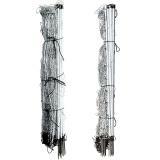 The same in all other respects (post size, post spacing, height and conductivity). Fantastic product. 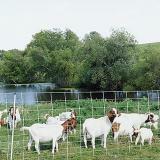 I purchased 1200 ft. Easy installation and it works great for my goats. Will purchase more in the future. This is my 2nd purchase for this product I now 200' . 100' just not enough might even go bigger. I use a single stake, because our ground is so hard. Working on a pre-hole making device so that it's easier to into the hole. This fence is wonderful. It is easy to put up and take down. Given our dry, clay type soil; we use the pos/neg during the dry season. I would recommend this product. 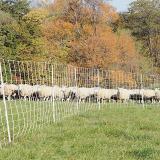 We have used ElectroFence for years with sheep. Now we have no sheep, but find it works really well for our dogs for the past 5 years. It really is great when we go RVing. Dogs are to be kept on a leash which makes none of us very happy. 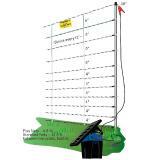 We have had no problems with any park when we put up the fence (1 length) around our rig. The dog gets to 'run' free and we aren't having to keep one hand occupied with the leash. We don't let the dog run in the yard unless we are there with him. 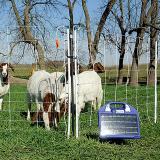 Since we have some very dry spells here in Central Texas in the summers, we purchased the pos/neg version of the 11/48/12 net for our Nubian goats. We've been able to set up temporary foraging areas for the adult does and another area for a doeling who is being weaned and her "companion" doe (not lactating). The most time consuming part of set up was mowing the tall native grass where we wanted to put the fence. The rest of the set-up was quick and easy. 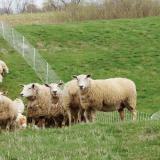 This is our first experience with electric fencing, and we couldn't be happier.